How do I get a title to a Mobile or Manufactured Home that has never been titled in the past? How do I get a title on my vehicle? How do I get a VIN inspection? How do I release a lien from my title? How do I file a lien on a vehicle? How do I get a replacement (duplicate) title? How do I sell a vehicle with a Wyoming title? How do I get a title for a boat? How do I get a title for a trailer? How do I get a title for an MPV (multi-purpose vehicle)? How do I get a salvage title if my vehicle has been declared a “total loss”? How do I change the brand on my title from “salvage” to “rebuilt”? How do I get a vehicle identification number for a homemade trailer or kit car? How do I get a hull identification number for a homemade boat? How do I change the name on my title due to a divorce? How do I change ownership of a vehicle due to the death of the owner? When would I need a separate odometer disclosure statement? When would I need a power of attorney? When would I need a warranty and notarization form? How do I know how much my license plates will cost? When do I pay my sales tax? 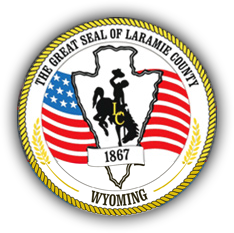 ©Laramie County, Wyoming. All rights reserved. Website Design by Wyoming Network, Inc.